Charlotte 49ers sophomore forward Evan James was honored with a pair of awards as he was named to Top Drawer Soccer’s National Team of the Week and was also tabbed as the Atlantic 10 Men’s Soccer Player of the Week. James had the game-winning goal with five minutes remaining against Campbell and also tallied an assist on Charlotte’s first goal in the game. Earlier in the week, James scored the 49ers' lone goal in a 1-1 tie against Clemson. 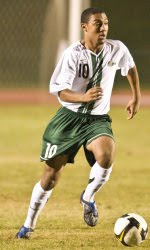 A 2008 Atlantic 10 All-Rookie Team selection, James currently leads Charlotte in points with seven and is tied in goals with two. His seven points puts him in third the A-10 and in a tie for third-most goals, while his three assists lead Charlotte and the A-10. The 49ers host the Charlotte Nike Invitational this weekend with Appalachian State, Winthrop and California State Bakersfield all converging on Transamerica Field for the weekend tournament. The Niners will face Cal State Bakersfield on Friday at 7:30 p.m. before facing Winthrop on Sunday at 7 p.m.